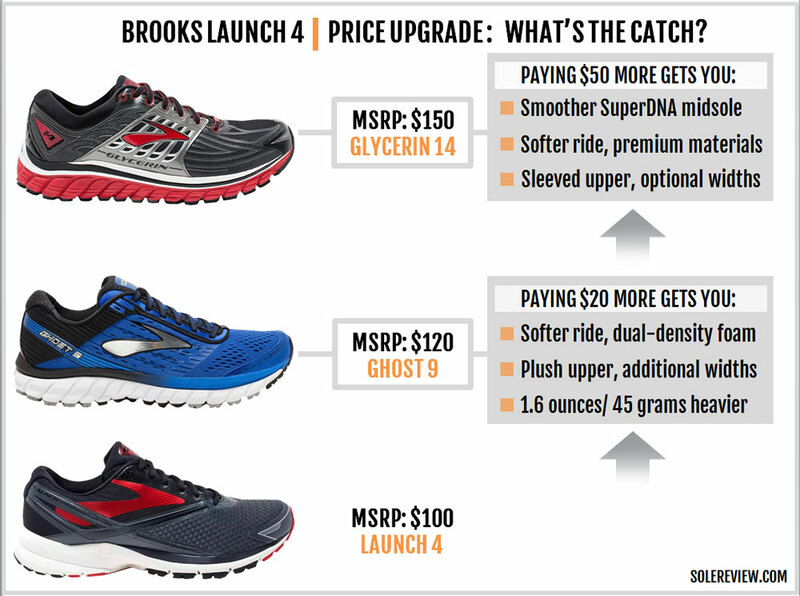 Brooks’ marketing pitch: Offers a lightweight and responsive ride you can count on. Upper: Spacer mesh, fused and stitched-on synthetic. Midsole: Single-density BioMogo DNA foam. 10 mm heel to toe differential. Outsole: Hard carbon rubber under the heel, softer blown rubber under the forefoot. 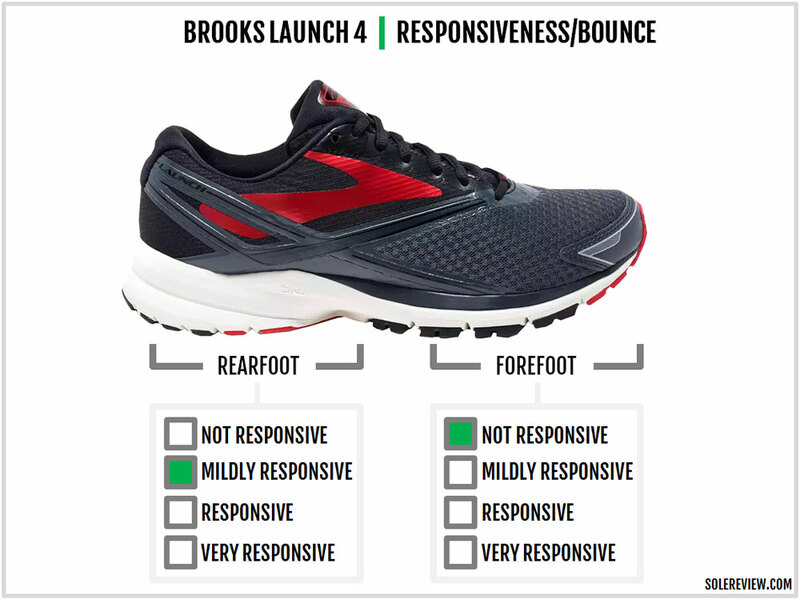 Brooks’ value-for-money trainer gets a (relatively) softer and smoother ride, and a wider forefoot fit than the Launch 3. It's an ounce lighter too. The Brooks Launch has a fascinating backstory. The shoe was released in late 2009 and quickly became a crowd favorite. 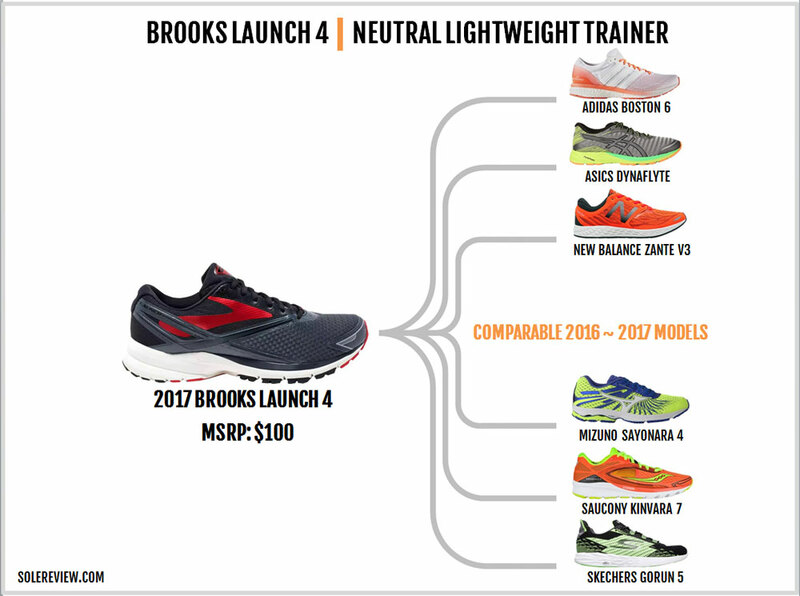 To everyone’s horror, Brooks dropped the Launch after just a year. Launch loyalists weren’t having it, and initiated a campaign to get their favorite shoe back. The updated Launch 2 was introduced in 2013. It had a three-year run, following which the Launch 3 showed up. As things stand today, it isn’t clear what update timeline the Launch will stick to. The Launch 3 came a full three years after the 2; and the Launch 4 within a year of the Launch 3. Perhaps the Launch update will settle into a biennial cadence like the Beast? We have a feeling that even Brooks is still trying to decide which one it is going to be. 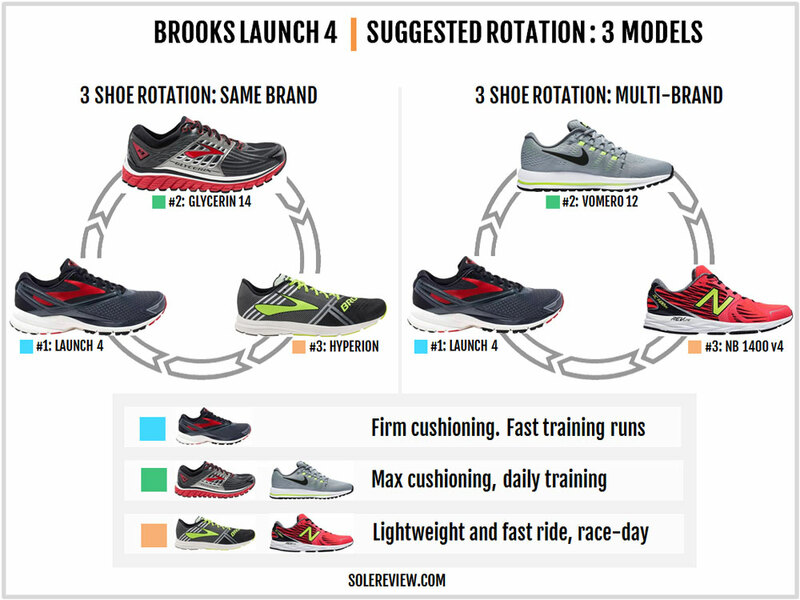 So what is the Brooks Launch, and why do runners like it so much? The original Launch had a minimal racer-like upper bonded to a foam midsole. It was positioned as a lightweight pace-trainer without the cushioning trade-off. A value-for-money MSRP of $100 only made it more attractive. The Launch V1 was placed between the more cushioned Ghost and the lightweight T7 Racer; it had a generous midsole stack and offset (10 mm), while partially offering the speedy character of race-day shoes. The Launch 2 stuck to the original premise, but the shoe got a complete overhaul. It left behind the racer-like upper of the Launch V1 for a more traditional design, and the midsole was an evolution of the original Launch. Regardless of the sweeping changes, the Launch 2 received satisfactory approval ratings from its fan base. Compared to the Launch 2, the V3 received a lukewarm response. It wasn’t so much about the ride – after all, both successive versions shared the same midsole and outsole. Rather, it was the narrower fit of the V3, a byproduct of an upper covered liberally with fused overlays. Other than that, the Launch 3 did what it was supposed to. It was a versatile shoe capable of donning many hats, its 10-ounce weight making it a non-clunky trainer suited for a broad range of use. Structurally speaking, the Brooks Launch 4 is a major update over the Launch 3. The upper is new, and so is the midsole and outsole. At a functional level, not a lot has changed. The update you’ll probably notice the most is the wider upper fit, which is the result of a new stitched-on toe bumper and the elimination of fused overlays over the forefoot. The ride is slightly softer under the heel and forefoot. That happens because there’s deeper grooving under the heel, and the blown rubber forefoot gains an extra 5 mm of thickness. These changes aside, the new Launch stays true to its core character. And if you’re new to the Launch, you should know what it is not. It is not a softly cushioned shoe with a roomy fit. When placed on a broad spectrum of running shoes, the Launch 4 has a firm ride and a snug fitting upper. One thing which the Launch 2 did differently from the Launch 1 was to leave behind the stitched upper overlays. In lieu, the Launch 2’s upper relied completely on fused layers. The Launch 3’s upper was also based on the same template, favoring welded layers over stitched ones. The Launch 4 has a mix of both. For the first time since the Launch 1, the toe-bumper is a stitched type instead of a welded one. There’s another area where the Launch 4 differs vastly than the previous Launch. The Launch 3’s forefoot was smothered with fused layering. This design, when combined with the fused bumper, made the fit narrow. This is the primary reason why runners preferred the Launch 2 instead. The Launch 2 did not have these layers and kept the forefoot uncluttered. This year, the Launch 4’s upper is heavily inspired by the Launch 2. Like the V2, the forefoot has a clean profile with no fused overlays. Most of the layers are located on the midfoot and the rear. Contrast this to the Launch 3, which had a generous spread of welding on the forefoot sides. Naturally, the Launch 4’s cleaner design makes the forefoot wider fitting compared to the Launch 3. While the Launch 4’s forefoot is similar to the 2, the mesh used is a simpler kind. The Launch 2 and 3 had a fancy looking 3D mesh; this year, it’s a subtle yet soft spacer mesh doing the honors. There’s a minor trade-off in the form of breathability. The 3D mesh used on the V2 and V3 vented better in the forefoot and midfoot than the Launch 4’s closed mesh. The mid and rearfoot use welded overlays which have a raised, rib-like profile. It’s almost as if Brooks took pieces of thick synthetic and then sealed them over with a heat-fused laminate layer. 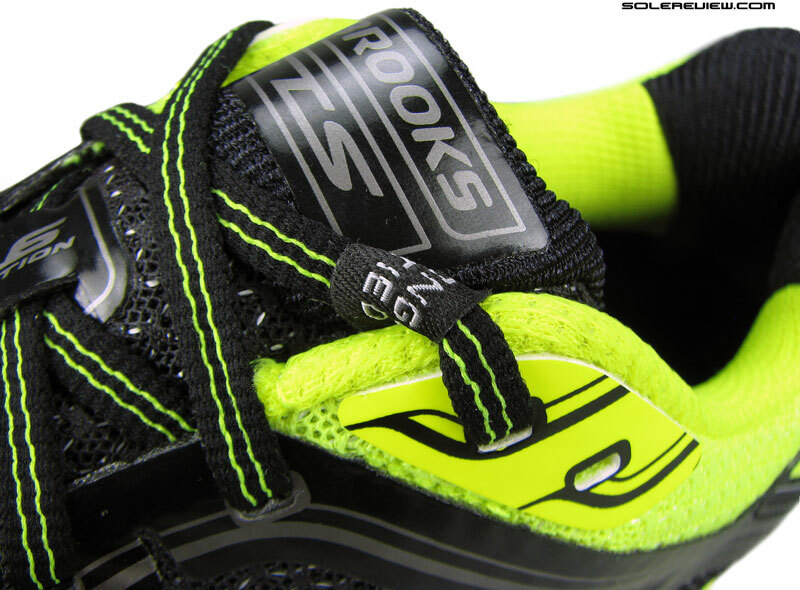 The lacing area uses thin fusing, and Launch 4 uses round laces – the same as the Launch 3. We’d rather prefer the flat laces of the Launch 2, though. Flat laces just feel right on a shoe which is meant for medium to fast paced runs. It is also worth noting that the starting point of the Launch 4’s tongue moves back a little when compared to the Launch 3. Also, the first lacing row gets a new loop which the Launch 3 did not have. Except for a few Brooks models like the Glycerin, the tongue lacks a sleeve attaching it to the upper. 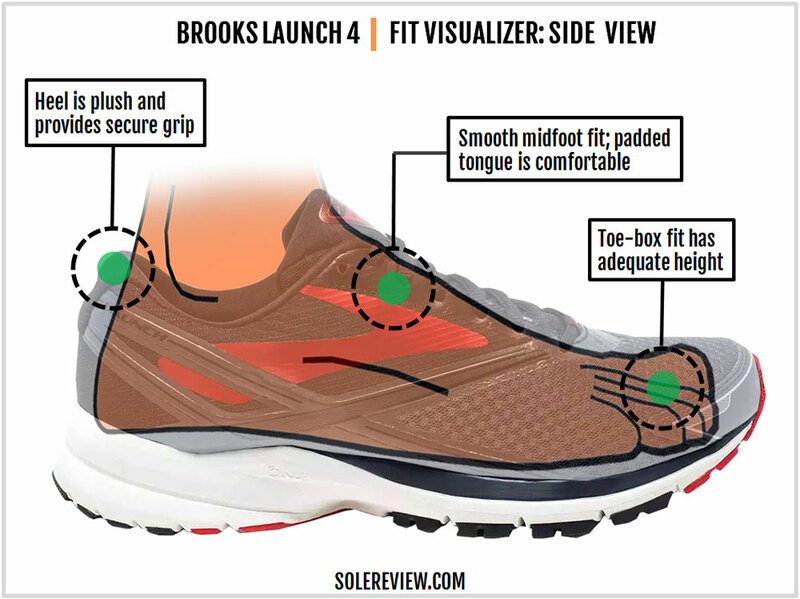 Brooks gets away with this because they use a secondary lace-loop near the top which they call the ‘tongue-tied’ loop. This nifty feature stops the tongue from moving around. Otherwise, the tongue is quilted plenty with foam, and the lining has a soft hand-feel. The same material is used in the heel, which also packs in a lot of foam. There’s an internal counter which gives rigidity to the heel area and also makes it narrow and snug fitting. None of the previous Launch models had much reflectivity to begin with, and that doesn’t change on the Launch 4. The low-light visibility element is confined to a small triangular trim over the heel. The Launch 2 and 3 shared an identical midsole and outsole; the Launch 4 arrives with brand-new bottom components. The design basics stay the same. 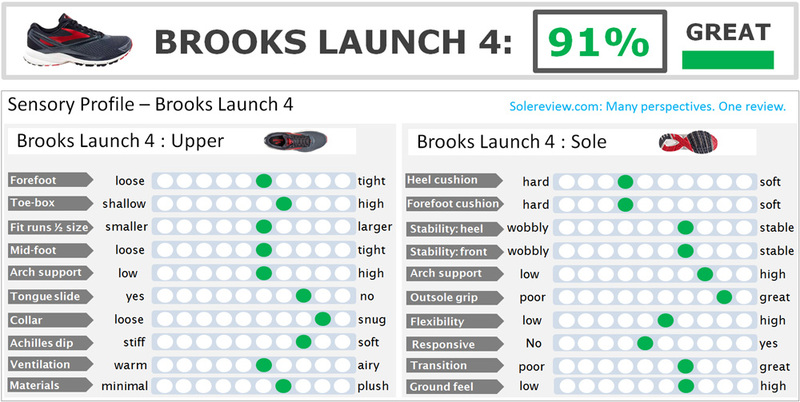 All (past) Launch models have had a single-density foam midsole with a ridge running around the rearfoot area, and the Launch 4 is no exception. The midsole is made of a single foam material throughout, and the rearfoot has a prominent ridge which visually splits the midsole into two halves. The midsole ridge which you see on the Launch is meant as a cushioning aid; this design allows easier compression of the midsole, independent of the firm foam used here. That said, the Launch 4’s midsole has an aesthetically cleaner and streamlined scheme. The midsole has a gentle under-arch curve, a feature which the Launch 3 had too. Inside, there’s a removable insole made of compression molded foam. There’s a soft fabric topping above and molded details on the reverse side of the insole. Another sheet of EVA foam separates the insole and the midsole. 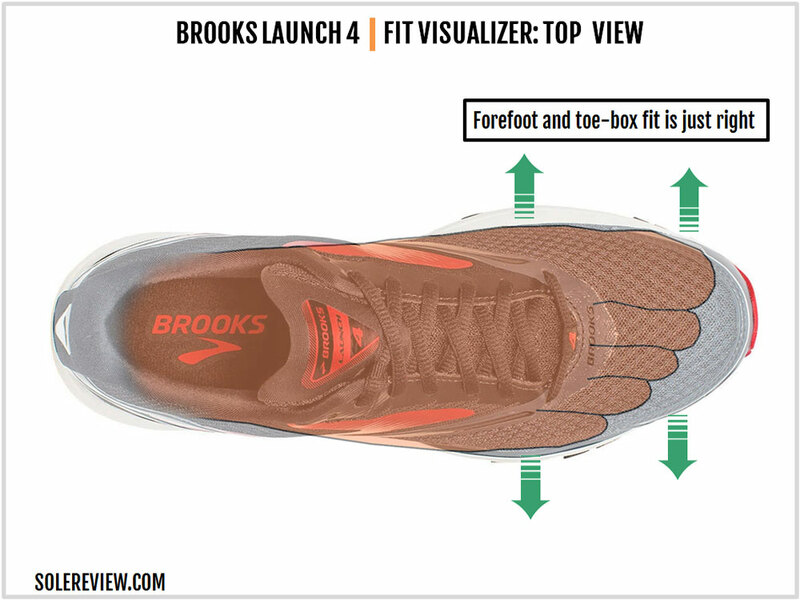 The design mandate for the 2017 Brooks Launch 4’s outsole appears to be a softer and smoother ride than the V3, and that is reflected in the new updates. At a casual glance, both the Launch 3 and 4 seem to share a similar outsole. In the front, there’s a softer blown rubber compound, and a harder rubber covers the rearfoot. Both the outsole versions feature the thin midfoot ‘waist’ which has been unique to the Launch. The midfoot outsole is noticeably thinner than the rest; one could even picture the outsole as an hourglass! But look closer, and the changes on the Launch 4’s outsole begin to emerge. The midfoot gains an additional flex groove, and the rearfoot also receives deeper cuts intended to deliver better flexing. The heel crash pad design changes too, with the objective of better splaying than the Launch 3. Overall, the Launch 4 is more flexible than the Launch 2 and 3. Right under the heel, the Launch 3 had a section of exposed foam. On the Launch 4, the area of uncovered foam grows larger and contributes to the difference in cushioning. The blown rubber slabs under the forefoot are also slightly thicker than the Launch 3. The Launch 4’s grip levels go up. The forefoot uses lugs which are thinner and sharper, and when combined with the inherent softness of the rubber, the outsole produces an excellent hold over most running surfaces. The new Launch is nearly an ounce lighter (9.0 oz vs. 9.8 oz) than the V3, and that’s probably due to all the outsole updates. The Launch 4’s robust build belies its $100 MSRP. Materials have not been skimped over, and the entire shoe is an example of efficient value-engineering at work. The upper is sturdy, and so is outsole which is made using a generous spread of rubber. Midsole cushioning is usually a casualty of long-term use, especially when it’s made of an EVA foam variant. But then, the Launch has a firm ride which extends the lifespan of the midsole foam. We’ve yet to see a shoe where a stitched toe-bumper resulted in a shallow toe-box. As a general rule, a stitched toe-cap creates more height than fused ones. Since the business end of the Launch 4 comes equipped with a stitched toe-bumper, you needn’t worry about toe space. There is sufficient vertical room available for your toes, big and small. The interiors have a smooth fit quality. The external upper sticks to a fused-only design which eliminates seams on the inside. The tongue is soft and filled with foam padding, and it does an excellent job of filtering lacing pressure. The midfoot does feel a bit warmer than the Launch 3, though. 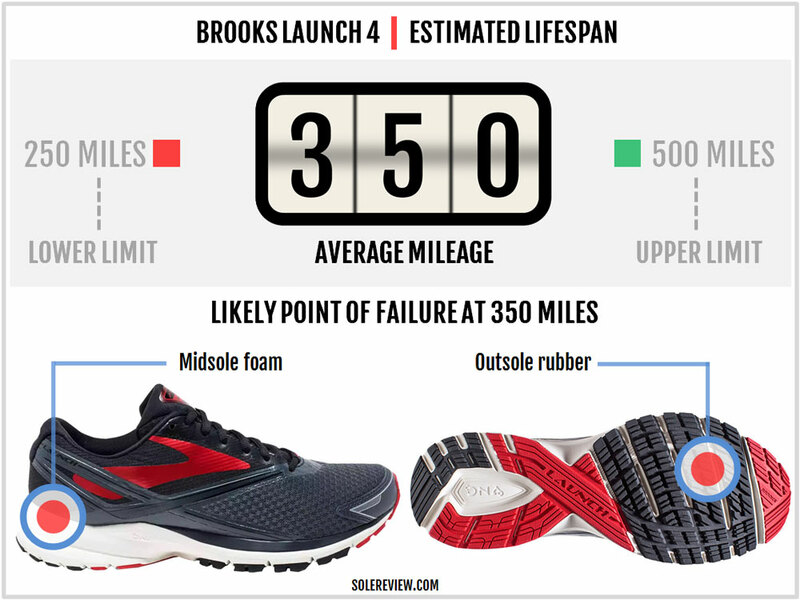 The Launch 3 used a sublimated Brooks logo formed by color variation rather than a separate fused layer (which the Launch 4 has). Also, the mesh is a closed type this year. The Launch 3 used a 3D mesh with large pores allowing better ventilation. The Launch 4’s heel feels very secure. Not only does it have a molded internal counter, but there’s a lot of foam tucked behind the collar lining. As a result, the heel does an excellent job of holding the foot. The mesh lining has a soft hand-feel which produces a plush sensation. The same last (which determines the upper fit) has been used in the Launch 2, 3 and 4. So why does the Launch 4’s forefoot feel wider than the 3? As it happens in most cases, the materials and the construction result in a fit variance. The absence of fused layers along with the stitched toe-bumper makes the forefoot fit this year. The same applies to the toe-box fit as well. 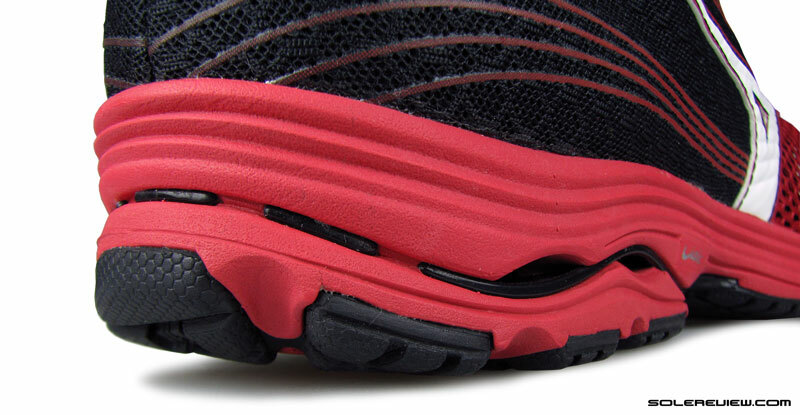 The stitched toe-bumper has a greater range of motion than the fused one used on the Launch 3. Hence, both the forefoot and toe-box fit wider than before and has a sweet-spot of fit. It is snug fitting without being uncomfortable. Also, it’s not just about the stitching, but how the bumper is designed. The Launch 4’s stitched toe-bumper is shorter on both sides than the Launch 3’s, which means there’s less material over the forefoot sides. The lacing position – or rather the starting point of the tongue has moved rearwards, which softens the forefoot top vs. the Launch 3. This difference is felt during the flexing of the shoe. If you compare the Launch 4 with other neutral cushioning shoes – say, the Ghost – then the ride quality will be categorized as firm. The foam used in the Launch’s midsole is a firm kind; marginal softness is provided by the insole, blown rubber forefoot, and other features which work in tandem. 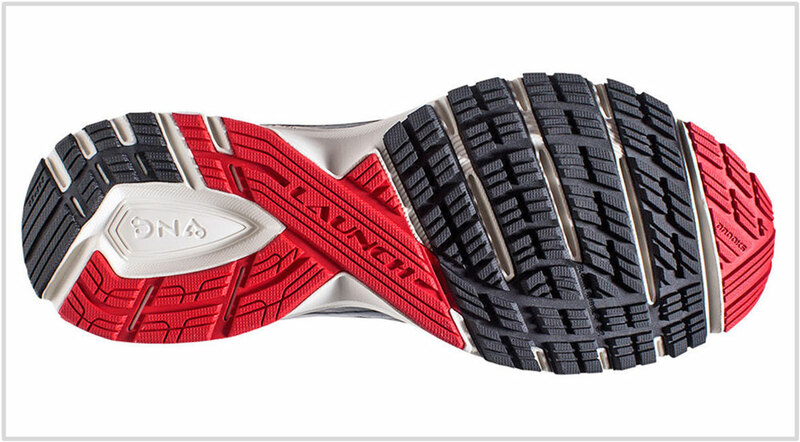 On a relative basis, however, the Launch 4 is softer and smoother riding than the Launch 3. This is the result of outsole updates which make the ride softer. The rearfoot has a couple of ride-impacting changes. First, the pieces of rubber on either side has deeper grooving than the Launch 3, along with a redesigned crash pad. This change allows the Launch 4’s rear outsole to flex and splay better than the Launch 3 – something which increases softness. In a way, the V4’s rearfoot outsole design is similar to the Launch 1 in its treatment of flex grooves. And remember the section of exposed midsole foam (under the heel) which is larger when compared to the Launch 3? That helps make the ride softer too. The forefoot uses a slightly thicker rubber than the V3. So along with the rearfoot, the front also turns a bit softer. The midsole sidewall ridge compresses on weight loading, as did the Launch 2 and 3. 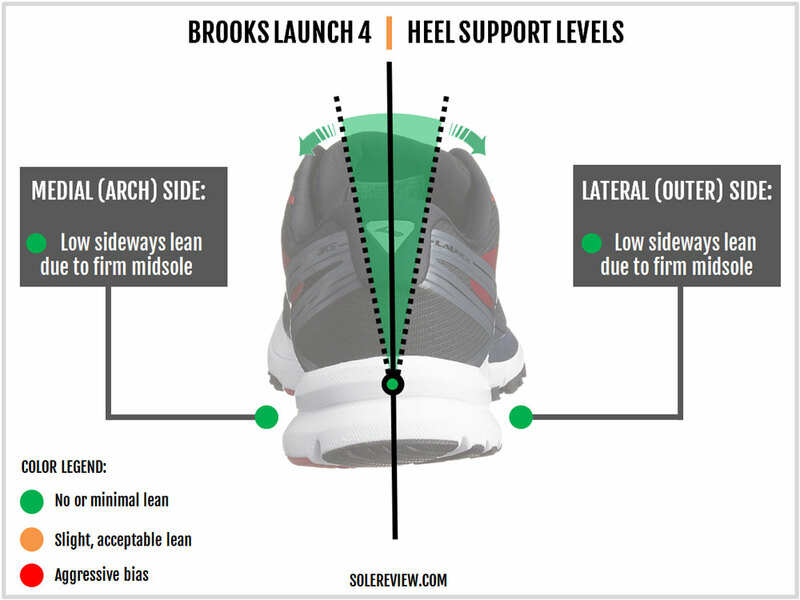 The Launch 4’s cushioning is focused near the upper and bottom areas, with the midsection being relatively firm. Near the top, the foot is in direct contact with the insole and foam lasting. At the bottom, the outsole design influences the cushioning quality – to a certain extent. We see the Launch 4 being used for a broad variety of runs. Its firmness makes it suitable for medium-paced training runs, and the ample midsole stack will work for marathon distances too. That said, a (soft) cushioned trainer the Launch is not, so consider the Ghost or the Glycerin if you need a plusher ride. The Launch 4’s midsole has a flat, one dimensional quality to it. We’ve often called the Ghost and Glycerin non-responsive, but the Launch 4 is truly so. The ride has ample padding, but there’s a lack of springy behavior in the midsole. Some feedback comes from the foam insole and the exposed foam area in the outsole, but calling that ‘responsive’ would be a stretch. 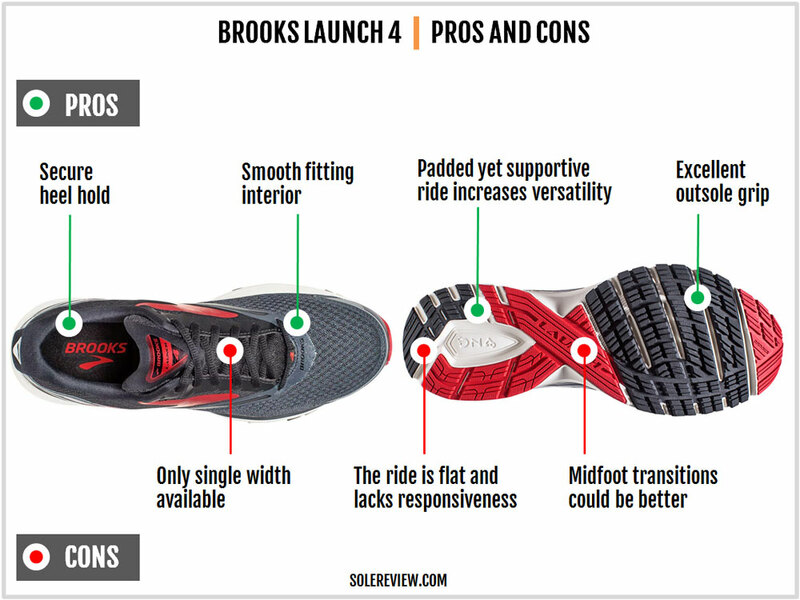 As most firm riding shoes are, the Brooks Launch 4 is supportive. The firm midsole does not throw your foot around, and the exposed foam cavity below the heel keeps the foot centered. Compared to the Launch 2 and 3, the heel landings feel gradual and the overall progressions smoother. The Launch 4’s outsole flexes better than the past designs due to the enhanced grooves and the redesigned crash pad. The increased articulation not only affects the cushioning quality but the quality of transitions too. It also helps that the Launch 4 midsole is made of a single material from heel to toe; this produces an efficient transition quality. 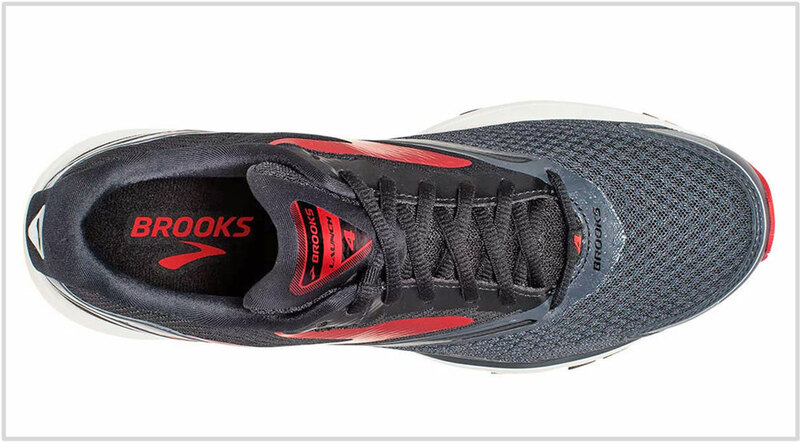 The Brooks Launch appeals to runners not because it is a plushly cushioned shoe, superbly lightweight, or amazingly responsive – the Launch is none of these. Instead, the Launch 4 is a running shoe recipe which mixes everything together in moderation. The midsole has just enough cushioning and little else, and the upper has a fit quality which feels right in most areas. Lest you forget, the Launch is great value too. 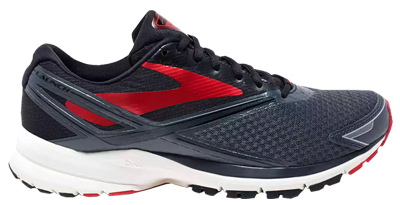 It demonstrates that a $100 MSRP doesn’t necessarily mean a cheapening of materials; the Launch 4 makes you feel that you’re wearing a shoe from a higher price segment. Be it the type of upper mesh used or the amount of outsole rubber available, at no point you get the sense that the Launch 4 is an entry-level shoe. Transitions are smooth and economical on the Launch due to its single-density midsole design. Newly introduced grooving on the outsole makes the landings soft, while the overall ride has a supportive character. The Ghost 9 might not give you the degree of separation (from the Launch) you need, so for a plusher ride experience, the Glycerin 14 is the shoe to get. It’s got a noticeably softer ride than the Launch, and an upper which uses a premium material package. The Glycerin is great for days when you just want a cushioned shoe to do your easy runs in. If this recommendation were written a few years ago, then we’d have suggested the T7 Racer as the speed shoe. But this is 2017, and T7 is but a distant footnote. 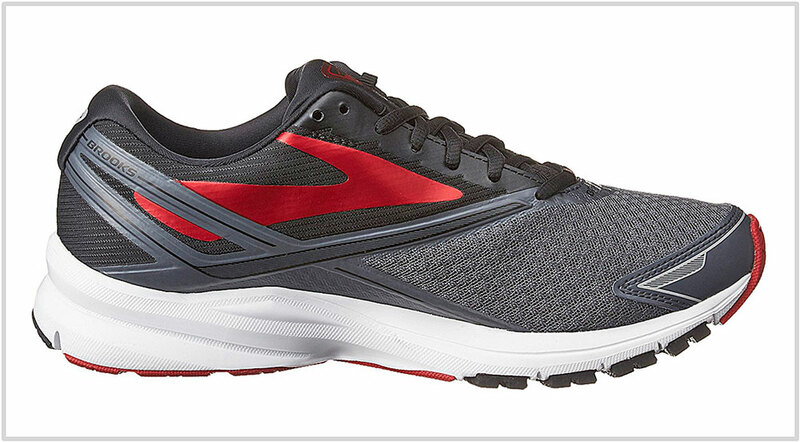 So instead, the Brooks Hyperion is going to be your race-day shoe. For premium neutral cushioning outside of Brooks, the adidas Supernova Glide 9 or the Nike Vomero 12 will complement the Launch 4. Though the quality of cushioning differs across both, they are noticeably softer than the Launch 4 and suited for the long and easy runs. The New Balance 1400 V4 is an excellent race-day or track workout shoe. It’s got a surprisingly high heel drop of 8 mm (check) and a padded midsole which does a good job of damping the ride. 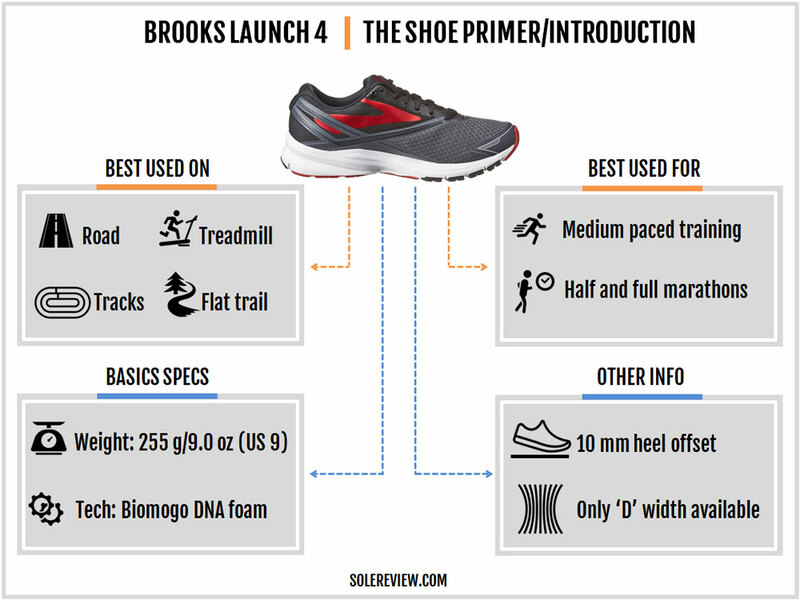 The Brooks Launch 4’s ride is a mite softer than the 3, and that’s due to the updated outsole. The midsole, while redesigned, does not affect the cushioning as much. The foam has a similar density as the previous Launch. Multiple changes take place in the upper fit. Removing the fused layers over the forefoot opens up space, and so does the switch to a stitched toe-bumper which creates vertical toe-box room. The support levels of the midsole are similar to the V3, and yet the Launch 4 betters the V3 in transition quality. Design enhancements like the better-articulated flex grooves and updated crash pad make the shoe smoother and gradual to run in. It likely contributes to the weight savings too, making the V4 nearly an ounce lighter than the V3. From a visual standpoint, the Launch 4 is a return of sorts to the Launch 2. The forefoot has a cleaner profile, and aesthetic tweaks made to the rest of the upper and the midsole gives the new model a streamlined look. There’s a straightforward upgrade path from the Launch 4. Above it is the Ghost 9, Brooks’ popular neutral cushioning trainer. Neither too firm nor too soft, its ride has a smooth and supportive quality. On a relative scale, the dual-density cushioning is softer than the Launch 4, and the upper uses plusher materials. Right at the top is the Brooks Glycerin 14. It uses the softer SuperDNA foam variant, and that makes the Glycerin an even softer shoe than the Ghost. All this is relative, though. Much like the Ghost, the Glycerin is far from mushy, and has a supportive quality. The Launch and the Glycerin have an heel-to-toe differential of 10 mm, while the Ghost has a higher 12 mm drop. Out of this list, three models are similarly priced to the Launch 4. The Saucony Kinvara 7 (the K-8 release date is in March 2017) is similar in spirit; the lightweight EVA midsole with an Everun heel insert makes the ride padded (not soft) and fast. The difference lies in the Kinvara’s 4 mm drop (vs. 10 mm of the Launch) and its tighter fitting forefoot. The GoRun 5 is Skechers’ popular training shoe with plenty of cushioning to go around. It spans the chasm between the more cushioned GoRun Ride 6 and the GoMeb Razor. It has a slightly roomier upper and a softer ride than the Brooks Launch 4. New Balance has the Zante V3 at the same price as the Launch. Though it serves a similar purpose as the Launch, the Zante’s 6 mm offset midsole has a lower profile than the Launch. The rest are slightly more expensive than the Launch but within the same category. The original Launch felt a bit like the Mizuno Sayonara – at least when it came to the upper design. The Launch V1’s spacer-mesh upper had thin synthetic strips along with stitched detailing, and so does the Sayonara. That said, the Sayonara 4 has a firmer ride than the present-day Launch 4 due to its use of the Wave Plate. Slightly higher in the price is the dependable adidas adizero Boston 6. This shoe is an excellent balance of fast and cushioned, and is more responsive (springy) than the Launch 4. Like the Brooks shoe, the Boston has a 10 mm offset and belongs to a similar weight class. The Asics Dynaflyte is the most expensive of the lot. And yet, one would need to treat it as a Brooks Launch equivalent – at least from a functional viewpoint. The Dynaflyte has a tighter upper fit and a slightly firmer ride, but it’s a lightweight and padded trainer, just like the Launch 4. The production of this review was assisted by crowdsourced reviews from the community of solereview readers. Improve it by submitting a review here. Learn more about how our reviews are designed. Subscribe to our mailing list, and get regular alerts for new shoe reviews.